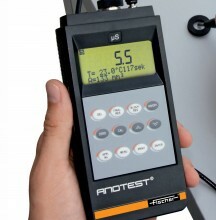 Introducing the ANOTEST® Measurement Instrument for testing the sealing quality on aluminium. The weather resistance of a finish is a function of sealing quality. According to DIN EN ISO 12373-5 and ASTM B 457-67, the admittance (Y) of a capacitor in which the anodic oxide film forms the dielectric is a good yard-stick of sealing quality. To measure the sealing quality of aluminium, Dyne Testing offers an instrument that measures the admittance according to standards, and designed for on-site testing. (1) The measurement cells with a ø of 6 mm and a ø of 26 mm do not permit standardized measurements because the test areas are too small or too large. For further information on the product and order information on standard accessories, please contact us for a quotation.